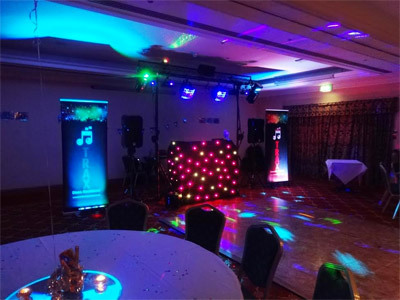 "Take Your Party To The Max With TRAX"
The Trax Disco Roadshow uses modern professional LED and laser lighting effects and powerful sound systems. A range of packages are available to suit most budgets and incorporated into our website is an event planning tool where you the client can login and plan your whole party and listen to and request music from our vast database covering all decades. 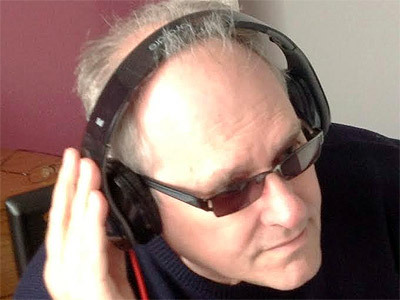 Your DJ Nick has over 30 years experience as a mobile DJ and working club residencies and has produced megamixes for local radio and The Disco Mix Club. Nick will discuss playlists and your favourite tracks with you to make sure that he has the music that you want to hear at your party, these tracks will be given priority he will also take requests from your guests and use his experience to play the right music at the right time. The show will incorporate professional jingles and megamixes/remixes produced by Disco Mix Club and Mastermix together with Nick's own megamixes. I also have a team of DJ's who work with me for greater coverage. Our website features many pictures & videos from parties and wedding that myself and my DJ team have completed together with many testimonials from previous clients and more information about us. Required by many venues, TRAX Disco Roadshow has a current PLI policy with AMP DJ in the amount of £10 million. Also required by many venues, TRAX Disco Roadshow has supplied satisfactory evidence of holding current PAT inspections of their equipment dated within the last 12 months. A Method Statement outlining TRAX Disco Roadshow&apos;s Health & Safety procedure for setting up disco equipment has been provided. Why do people choose to book TRAX Disco Roadshow? Looked good and I liked that you can online request songs. Professional looking business, great reviews. "Thanks Nick, for helping to make our christmas party really awesome!" "Thanks very much, it is always nice to be appreciated"
"Music was brilliant, good mix. Only downside was a couple of complaints after the event regarding his roadie, who I believed was his son. A bit of a nuisance running around, and jumping on chairs, even after being asked several times to stop. " "Hi I am sorry about my roadie's behaviour. He is not my son, he often keeps the children happy by playing games with them and I have had many comments about how it's great that he keeps them occupied, however he does suffer with ADHD and I believe one of the children there had the same problem, they may have got a bit boisterous. He does do a great job helping me but I will speak to him about this and ask him to tone it down in future." 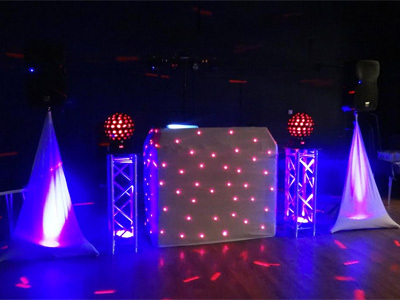 "We all had a fantastic night Dj was fab"
"Thanks for your great review. DJ Rick will be very happy"
"DJ Tony was really nice, set up and everything faultless. The only negative is the music played, started off great and also played lots of party songs to get people on the dance floor which he did. But later on the music wasn't so great, really old songs (bearing in mind this was an 18th Birthday party!) The dance floor emptied (which should be a sign) and never filled again. One person went to ask for some up to date music and he said he'd played it earlier on in the night (which was at the beginning as people were arriving). We didn't submit any requests before the night and in hindsight I wish we had! " "As you say in your response you did not submit any requests through our event planning system when you had every opportunity to do so. I understand from DJ Tony that you all had a a great night and your son was requesting many of the old songs. People do not always help when they say things like play something more up to date ie hip hop R&B Pop etc let us know what genre or just make a song request, what do you want as we are not mind readers. If we have just started playing some older songs you cannot just switch straightaway to something completely different or you will lose the dance floor. I have confidence in DJ Tony who is very experienced. However good a DJ is it always helps if the family encourages people to dance and lead the way. According to our DJ many people kept going outside smoking and also playing football (Including the Birthday Boy) and often missed requests that he played for them. I will point out that whilst Tony was doing your party he had a phone call with some"
"Although our party went very well we did seem to encounter a few problems with our DJ. The first problem being that he did not seem overly keen to compromise the lighting system due to a guest having epilepsy, and although the lighting was changed he did not seem very happy to do so. Secondly, upon booking the DJ we discussed the theme of the party, and at the time it seemed pretty clear the type of music we would have liked. Yet on the evening the music was completely wrong, it was not exactly “party like” music and after several (4 or 5) times of trying to explain to the DJ that the music needed changing as we had guests complaining about the music he seemed completely unbothered by this and took at least an hour (if not more) to change to the music in which we asked. Finally, come the end of the night like ANY party guests we keen for one or two more songs. Now I understand that the DJ finished at the time in which was agreed when booking but there was no notice to the guests that the last song was on, with this the last song was the Macarena (a song which is to encourage guests to the dance floor and also the first song of this kind through the evening) and when I approached our DJ after the song to request one last party song before he packed up I was asnwered with a quite aggressive, snarly reply which to put no other way really did put a downer on the end of the evening for the guests at how unapproachable, unsociable and snappy our DJ actually was. Unfortunately, I would not recommend your company to any friends or family in the of chance that they would receive the same service and unfriendly DJ as we did. " "You tend to contradict yourself somewhat by saying your party went very well, however you also say the music was completely wrong! if it was how come your party went very well, as it is you had every opportunity to make requests using our event planner but chose not to make any requests. In fact you never had the decency or good manners to come and introduce yourself or the person who's Birthday it was. It seems to me that you are giving this bad review because you are annoyed that I did not play more music after the end time I was booked for which is completely unreasonable, I cannot decide to just go ahead and play more music without getting approval first from the venue and this needs to be done about 30 mins before and any overtime paid to me, not after I have said this is your last track (which I did say) or after I have bid you all goodnight which is what I did. The truth is that the event went well because of the music I played which was in keeping of your rock theme, I think th"
"Highly recommended thanks nick for a great night!!!" "Thanks for your feedback. Best regards Nick"
"The DJ was very good, punctual with good equipment. Good choice for my birthday party, it completed the night "
"Thanks for your positive remarks. kind regards - DJ Nick"
"DJ Eddy was superb! Thank you for your professionalism as well as letting our guests get their all important song requests over to you. DJ Eddy picked the music like a pro- great choices, would recommend thoroughly. Many thanks!" "Thankyou so much for taking the time to give us a great review, i will pass your comments on to DJ Eddy"
"Thanks. that one word say's it all. Have a great Honeymoon"
"Nick was a very good DJ and made my daughter's birthday very special, everything went well she was over the moon!!!!!" "Thanks for giving me a great review. I look forward to working with you again - Regards DJ Nick"
"Nic was perfect It was an 80th Birthday Party. As requested the music was not too loud and appropriate. I have had a lot of excellent feedback from my guests and would definetly recommend him Ann "
"Thankyou. I am so glad that you enjoyed yourself - best Regards Nick"
"TRAX Disco provided an excellent service and a Disco that fitted into the theme of the evening really well. I would certainly use them again"
"Thankyou for your positive response.I hope we can look forward to more events from you. Regards and Happy New Year - Nick (Owner/DJ)"
"Fantastic Dj and a fantastic night thank you so much. The Winkless's "
"I am so glad that you enjoyed your day and thank you for your great comments and making us so welcome"
"Thanks for your response. It's nice to know that you enjoyed it, I will pass your comment on to our DJ Eddy." "Excellent service from start to finish. Would definitely recommend. Friendly service. Happy to meet our needs and was keen to make sure we were happy. Thanks for everything both the booking agent and Dj Rich." "Thankyou for your positive comments. I will let DJ Richie K know that you were happy with him. Kind Regards Nick"
"DJ Eddy was very able, personable and amenable. Music choices were prearranged on the whole, with guests able to make requests. We had a great night." "Thanks for your positive response, I am very pleased with DJ Eddy as he is doing a good job"
"Really polite and friendly guy. Interacted with us and was keen to impress. He even helped me put decorations up when he say me struggling!!" "That's what I like to hear. DJ Eddy is always very helpful. Thanks for your good feedback - Nick Davies (Owner TRAX)"
"Dj had a fallout with his girlfriend and we had a deep disco"
"I'm not sure what you mean by "a deep disco" but we did speak after your event and I have apologised and offered you a special deal on a future booking. I have spoken to the DJ who was very sorry and it is not the usual review that we get for him which are normally very good, he had just had a very bad day which can effect anybody as we are all human. I hope you give me the chance to make it up to you and give you a great night in the future. Regards Nick (Owner of TRAX)"
"Tailored perfectly to my specifications and Nicks judgement on the night." "Thank's for your positive comments, I hope I can be of assistance in the future"
"A very polite and co-operative DJ. No fuss, and targeted the music to his audience." "Thankyou for your comments I always aim to please"
"DJ Richie was brilliant. He came early ( he'd already been to the venue the previous evening to check it out) and spoke to me to find out what music I liked. It was my 50th birthday party and he kept the music to a nice volume as people were arriving so we could all have a chat. He was very friendly and attentive. He then got the party going after the buffet and all the songs flowed brilliantly. There was never a time when everyone walked off the dancefloor. He was fantastic and I would definitely book him again and would recommend him! He helped make the night a great celebration and ensured it all ran smoothly!!! Couldn't have wished for anything better!!!" "Thank you so much for your great response"
"Every one had a great time and I would use them again." "Thanks for your great response, my DJ Eddie was pleased to hear that you all had a great time"
"Excellent disco from Nick, played all the songs we and our guest requested. Lights were amazing and created a really good atmosphere. Nick even filmed our first dance and posted the DVD out to us which was great. Top service, would definitely recommend. Thank you"
"Thankyou for your excellent comments. 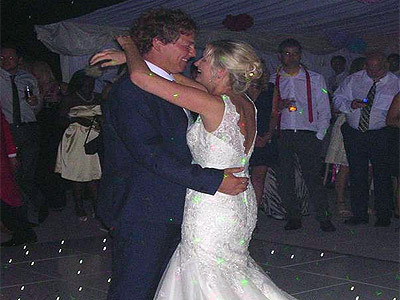 I am glad you liked the DVD this is just another of our services that we do not shout about but always try to do at weddings"
"We were extremely satisfied with TRAX disco services. The disco was booked for our 14 year old sons birthday party. My son could log in to the TRAX website and put songs onto his playlist, so his favourite songs could be played during the party. We booked the more expensive party package, and the lasers & lights were phenomenal. The music was excellent and a range of my sons playlist and Nicks expertise based on the playlist. It was slightly expensive, but you did get what you paid for. With the more expensive package the DJ has a roadie to help him and take photos/videos of the night. Nick even supplied a video of the party and photos free of charge. Nick was very approachable, & Professional and he answered any queries that we had. Nearly 200 13-14 years olds attended the party, and most said it was the best party they had ever been too. The DJ managed to create a great atmosphere, and the night was extremely successful." "Thanks for your positive feedback. As you say you get what you pay for and we always try to go the extra mile and exceed peoples expectations. I am pleased that you enjoyed the DVD and pictures that I sent this is all part of the service with my deluxe package." "We thought our DJ was very good. We gave an extensive play list before the event and many of our guests said how much they had enjoyed the music." "Thanks for your positive comments"
"This was the perfect dj for our party"
"I aim to please thankyou for making me so welcome"
"Everything was great especially the Did he sent afterwards"
"Hi, I think you mean The DVD I sent afterwards. Im glad you enjoyed the night and thanks for your positive response"
TRAX Disco Roadshow also offers a range of additional party services not directly linked to musical entertainment. Please note that needadisco.com has no editorial control over these images which are stored on flickr.com. If you have any concerns about what you see below, for example potential copyright infringement or unsuitable content, you should take this up with TRAX Disco Roadshow directly using the Contact section below, or else you may alert flickr.com directly quoting "set number 72157658111214672". 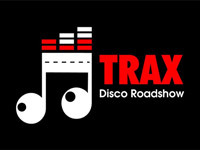 If you are contacting TRAX Disco Roadshow about an event, it's always a good idea to include the DATE, LOCATION, EVENT TYPE, AGE GROUP and TIMINGS to speed things up!